2013. Clarkson Potter. Hardcover. 276 pages. I saw this book at Barnes and Noble while waiting for a friend. It caught my eye because I own and use Bittman’s cookbook How to Cook Everything and have been wanting to take steps for healthier eating. I generally do well in keeping junk food or soda out of my kitchen, but I am terrible about including fruits and vegetables in my diet. I am open to eating far less meat and dairy products. Flipping through VB6, I saw some recipes and meal-planning ideas that looked intriguing, so I later bought the book. Bittman writes cookbooks for a living and loves to make and eat food. When his doctor suggests that Bittman should probably become a vegan, Bittman knows that he needs to make a diet change, but one he’s likely to keep. In the introduction, he writes “the idea of becoming a full-time vegan was neither realistic nor appealing to someone accustomed to eating as widely and as well as I do.” So he became a part-time vegan. Breakfast and lunch were his vegan meals and then at dinner, he was free to eat whatever he wanted. 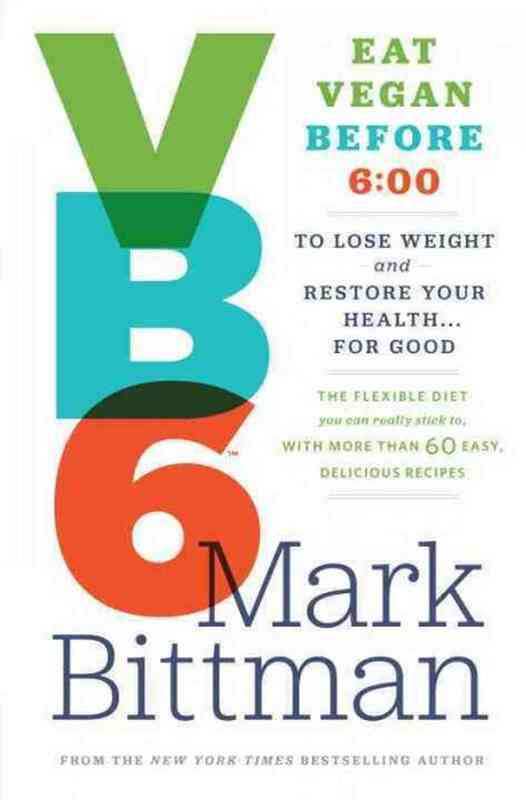 The first part of the book is called “Weight Loss and Better Living.” Bittman describes the problems with what he calls the Standard American Diet (SAD) and explains why VB6 is better for your health, and how it works nutritionally. I must admit that the first 60 pages were a slog to read. Bittman discusses myths and facts about calories and carbs and fat and something called the glycemic index. As I was already convinced that more vegan meals were a good idea, this discussion held little interest for me. I did wish that Bittman had discussed which non-dairy foods were rich in calcium. That is my major qualm about eating and drinking less dairy products. However, this perhaps reflects my particular health concerns rather than a flaw in the book. 1. Eat fruit and vegetables in abundance. 2. Eat fewer animal products. A few years ago, I read Michael Pollan’s book In Defense of Food, which proclaims this maxim: “Eat food. Not too much. Mostly plants.” I find Bittman’s VB6 diet to be very similar philosophically, but I liked Pollan’s presentation better. But Pollan’s book didn’t have recipes. And recipes are basically why I bought this book. I am aware that Bittman has a vegetarian cookbook and that there are plentiful vegan recipes on the internet. But Bittman’s cookbooks are so large and the recipes on the internet are countless. VB6‘s selected group of recipes are just enough to give me options while also appearing as a manageable set. One of the things I like about Bittman’s approach to cookbooks is that he always provides alternatives and variations to the recipe. He’ll list a slew of topping choices for one dish, or a range of substitute ingredients. In VB6, he also recommends what to stock in your pantry, and how to make and prep food for future meals. Homemade Cold Cereal – this is mostly rolled oats with nuts and fruit tossed in. I ate this for breakfast for several weeks, and mostly enjoyed it, but found the rolled oats a little bland in texture. My parents have suggested baking them, which I’ve yet to try, but I think that might improve the recipe. Fruit Smoothie – my first experiment with using tofu in the kitchen. Silken tofu is used to make a nice thick smoothie, without any dairy products. I made this last night with frozen fruit and it was delicious. Lentil Salad – I made this one tonight, but I was missing a few of the vegetables ingredients (my radishes and cucumbers had gone bad and I had no celery). I think the dish would have benefited from the extra texture and flavor these vegetables would have provided. Still, with the homemade vinegar and oil dressing, lentils, tomatoes and red onion, it was a satisfying meal. Creamed Mushrooms on Toast – This recipe is perhaps the most successful one I tried. It’s basically blended cannellini beans mixed in with sauteed mushrooms and herbs. It’s great on toast, but surprisingly divine over roasted cabbage. I also tried the creamed mushroom over rotini pasta, but didn’t think that worked as well. 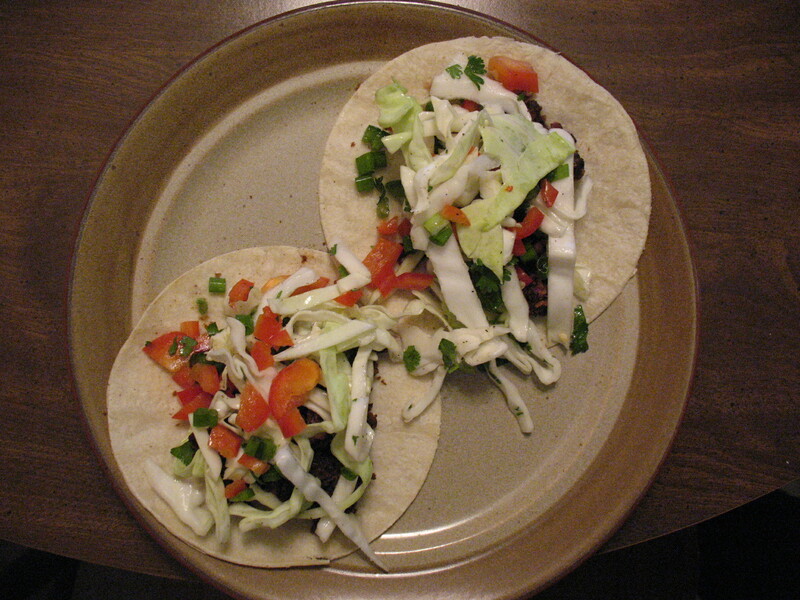 Black Bean Tacos with Tangy Cabbage – Another great success and responsible for my new appreciation for cabbage. The black bean mixture tastes great and pairs well with the cabbage (and other veggies) which form the topping. A definite keeper. Smashed and Loaded Sweet Potatoes – This recipe is basically a substitute for a regular baked potato. I am impatient and have taken the microwave route with this recipe, but have liked it just fine. My topping so far has been horseradish. I may try other toppings, but right now I’m liking this combination of flavors. All of the above recipes are from the breakfast and lunch sections. I haven’t tried any of the snack or dinner recipes. Also, though not from a direct recipe, the book got me to try sardines in a meal. (I found recipes online that recommended them on toast with mashed avocado. Not bad. Will try again.) I have also been more diligent about including fruits and vegetables with my packed work lunches. I have definitely appreciated having the book around so I can consult the recipes. There are more recipes and cooking tips I plan to try, but so far I have been pleased with the results. I still need to work on having less dairy in the house (it’s hard because I love cheese), but overall, I’m optimistic about the change in my diet. Homemade Levity – VB6: Eat Vegan Before 6:00 allows for individual flexibility and personalization, making the concept feel manageable, even for someone who hasn’t considered adopting a plant-based diet. I first saw the following meme on Sarah Says Read‘s blog today, but the original author is actually Jamie of Perpetual Page Turner, a new-to-me blog. I usually don’t do these kinds of memes, but I think the categories are interesting. Apologies if this meme has been omnipresent in your blogroll! Author you’ve read the most books from: I was more author-loyal when I was younger, so the answer to this question is probably Roald Dahl, or Brian Jacques. Nowadays, I am always picking up books by authors I haven’t read before. Best Sequel Ever: Barchester Towers by Anthony Trollope. I liked The Warden, but Barchester Towers was significantly better and did very interesting things with the characters who were in The Warden. Currently Reading: Small is Beautiful: Economics as if People Mattered by E.F. Schumacher. I’m enjoying it but may soon be putting it aside so I can start reading books by authors who will be in September’s National Book Festival. Drink of Choice While Reading: Water. E-Reader or Physical Book? Physical book though I get why people enjoy e-readers, and I probably would like it if I had one. Fictional Character that You Probably Would Have Actually Dated in High School: I didn’t date in high school, so I can’t really imagine a scenario where that would have happened, even with a fictional character. Edited to add: Also, I think this is a category geared toward bloggers who read a lot more YA than I do. Glad You Gave this Book a Chance: Lonesome Dove by Larry McMurtry. It’s wicked long and is a western but I had faith in those who recommended it to me, and it is possibly the best reading experience I’ve had this year. Hidden Gem Book: Winter’s Bone by Daniel Woodrell. I know the movie is well-known because of Jennifer Lawrence’s Oscar-nominated performance, but more people should read the book. It’s so so good. Important Moment of Your Reading Life: I joined a book club when I was a freshman in high school that was started by a well-respected teacher in the school. At first it was mostly teachers and myself, but there were a few more students added by the end. My reading experiences really branched out thanks to that club and best of all was listening to the teachers talking about books out of the classroom setting. Just Finished: Daughter of Smoke and Bone by Laini Taylor. Kind of Books You Won’t Read: with a few exceptions, celebrity autobiographies. Longest Book You’ve Read: David Copperfield by Charles Dickens. According the edition on my goodreads shelf, it is 974 pages long. First Dickens I read, least favorite Dickens out of the three I’ve read. Major Book Hangover Because of: Zeitoun by Dave Eggers. A great book but highly upsetting. For at least the next day, I couldn’t shake the feeling of being profoundly disturbed. Number of Bookcases you own: 3. One Book You’ve Read Multiple Times: The Call of the Wild and White Fang by Jack London (they are two separate novellas, but they are often published together). First read it when I was eight, I think, and just kept re-reading it throughout the years. Preferred Place to Read: In bed. Reading Regret: Compelling TV shows often tempt me away from reading time, which I sometimes regret. Series You Started and Need To Finish (all books are out): The Chronicles of Barsetshire by Anthony Trollope. Three of Your All-Time Favorite Books: Bury the Chains: Prophets and Rebels in the Fight to Free an Empire’s Slaves by Adam Hochschild, Delta Wedding by Eudora Welty, and The Beekeeper’s Apprentice by Laurie R. King. Unapologetic Fangirl For: Patricia Briggs’ Mercy Thompson series. Very Excited For This Release More Than All the Others: I don’t really keep up with new releases very well, but I’m looking forward to Lost Lake by Sarah Addison Allen which will be released in February 2014. Worst Bookish Habit: Checking out more books from the library than I can possibly read before they are due, even accounting for my county library’s fairly generous renewal limits. X Mark the Spot (Start at the top left of your shelf and pick the 27th book): A nice green hardcover volume of Novels and Stories by Sarah Orne Jewett. 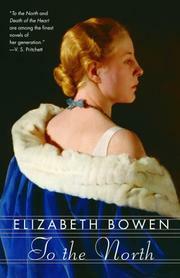 Your Lastest Book Purchase: To the North by Elizabeth Bowen. I had it out on interlibrary loan and was in the middle of it when the due date came up. Rather than go through the process of ILL’ing the book again (my library system doesn’t have electronic ILL requests), I bought it. Zzz-snatcher book (last book that kept you up WAY late): Daughter of Smoke and Bone by Laini Taylor. 1932. Anchor Books. Paperback. 307 pages. Recommended to me by: Eva of A Striped Armchair, as part of the Most Particular Compendium she made for me. Eva recommended To the North by Elizabeth Bowen because one of my favorite books is Eudora Welty’s Delta Wedding and Eva thought their writing styles were similar. I definitely agree. Like Welty, Bowen excels in capturing place, atmosphere, and the dynamic of groups of people. Bowen was an Irish writer, and this book is largely set in England, though it starts on a train traveling through the night in Europe. On that train, young widow Cecilia makes the acquaintance of the somewhat amoral Mark Linkwater. He later forms a romantic relationship with Cecilia’s sister-in-law and housemate, Emmeline. Cecilia meanwhile weighs whether to accept a proposal of marriage from a suitor. Gerda’s line as a hostess was of adorable inefficiency; with the air of a lost child she tottered among her guests, in one hand a glass dripping sherry, in the other a semi-opaque yellow drink in which the skewered cherry appeared as a threatening shadow. Wherever a glass was put down a small sticky ring stamped itself: she pounced on these rings with her handkerchief with little reproachful cries (no one advised her to wipe the underneath of the glasses) . . . She was followed around by a young man she had known in the Navy, who each time she succeeded in placing a drink with a guest smiled proudly, as though she had sold a raffle ticket, and gave her another drink off a tray. The book could also be characterized as a melodrama, especially in the story arc of Emmeline and Markie (yes that is what he is called). The ending reminded me of the classic film melodramas of that era. I’m not a huge fan of melodrama, but Bowen does it well. Both Welty and Bowen wrote dense psychological passages in their novels that, for me, range from impenetrable to brilliantly insightful. For instance, Bowen sometimes lost me when she described the many shifting moods of Markie and Emmeline’s relationship. On the other hand, a fairly intricate and ambitious metaphor comparing Cecilia’s widowhood to the redevelopment of an old estate really paid off emotionally and aesthetically; I was really moved by it. I’m so glad Eva’s recommendation pushed me to pick up a novel by Elizabeth Bowen. Bowen wrote about ten novels, so I know I’ll have more opportunities to soak in her writing. 1974. Thomas Dunne Books. Paperback. 264 pages. Earth is waging war against an alien race they have named the Taurons. Little is known about the Taurons, but Private William Mandella and his unit are sent to fight them in distant outer space. First they are trained on Earth and then on a planet so harsh that some of them die there. The war is impossible and ridiculous: space travel warps time, which means the aliens may either be ahead technologically or behind and they won’t know until they meet in combat. In the meantime, while the soldiers are away only months at a time, years, decades and eventually centuries pass on Earth, leaving the soldiers as bewildered outsiders to their own home planet. Author Joe Haldeman was drafted to and wounded in the Vietnam War and wrote this book in the early 1970’s. 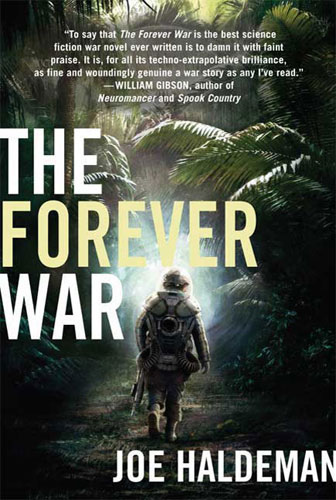 The Forever War may be science fiction, but Haldeman’s war experience permeates the narrative. I was hearing this, but the only thing that was getting through to my brain was that a third of our friends’ lives had been snuffed out less than an hour before, and he was sitting up there giving us a lecture on military theory. ‘So sometimes you have to throw away a battle in order to help win the war. This is exactly what we are going to do. This was not an easy decision. In fact, it was probably the hardest decision of my military career. Because, on the surface at least, it may look like cowardice’ . . . . I had to stifle an impulse to laugh. Surely “cowardice” had nothing to do with his decision. Surely he had nothing so primitive and unmilitary as a will to live. The connection of The Forever War to the Vietnam war, and to modern warfare in general, is what drew me to read this book. I hear in the news about how many soldiers struggle to find their place in society after returning from war. The time-warp aspect of the novel seems like a perfect analogy for this situation. I soon found that The Forever War had even more to offer than its timeliness. The Forever War is poignant but also funny, bluntly cynical but with a good heart. The story is packed with interesting details of its future universe but it never goes on too long about any one of them; I thought the level of brevity was perfect. I could discuss the details of the world of The Forever War at length, as I found them fascinating, but I will give just a sampling. From the start of the book, which is set in what was then a future year – 1996 – women are fighting with men in combat, in what seems to be equal numbers. The soldiers are all casually promiscuous with each other, and Haldeman lets drop later that the women are “compliant and promiscuous by military custom (and law)” (p. 45). Another detail: when the troops face the Taurons for the first time, their commander uses a phrase to trigger a (false) implanted memory of the Taurons brutally slaughtering humans. Although Mandella is aware that it is false, he and the soldiers succumb to their programming and engage their enemy with no hesitation, overtaken by this strategically stoked rage. On Earth, violence is rampant and jobs are scarce. People illegally ‘sublet’ their jobs through brokers who charge the unemployed a heavy fee for the opportunity to have a job. Sexual orientation becomes a major aspect of the book. At first, it is the government’s encouragement of homosexuality as a form of birth control. As time passes in the book, most of the human race becomes homosexual, and the heterosexual characters are the minority. Mandella is at first taken aback by the ‘rise’ of homosexuality, but later it’s just the way things are. In an interview I read online, Haldeman said “I think I wrote [the part about homosexuality] just to isolate the main character. He was the only straight guy in a gay Universe. And so they called him, “the old queer” because he was the only queer character. I wanted to isolate him. That is what it was about. There’s not much there about sexuality, or about real homosexuality, which is to me just another way of going about it.” In the interview, he also mentions how a gay friend of his didn’t care for how Haldeman’s gay male characters were all feminine and he said if he wrote The Forever War today, he would probably change that. This is not a novel where I fell in love with the characters, but I did like them. Mandella is kind of an everyman. Sometimes he gets to be the hero of the hour, but sometimes he is unlucky and sometimes he makes a bad call. There is a love story tucked in there too, nothing overwrought, though it does have its tragic moments. I was prepared for a bleak ending, but it was actually more hopeful than expected. The resolution to the war was surprising and hilariously cynical if looked at in a certain way: the war’s resolution was only possible when humans became less human. Haldeman wrote a sequel to The Forever War called Forever Free, which I am curious about. If anyone has read it, let me know if it’s worth it. A Reckless Memoir of Hotels, Hustles, and So-Called Hospitality. 2012. Doubleday. Hardcover. 247 pages. After earning an oh-so-marketable philosophy degree, Jacob Tomsky took a job valet parking at a New Orleans restaurant. Thanks to a tip from a fellow disgruntled valet, he upgraded to becoming valet at newly opened luxury hotel. And so he unwittingly embarked on a career in the luxury hotel business which led him eventually from valet to the front desk, and from the Big Easy to the Big Apple. In Heads in Beds, Tomsky freely dishes on his behind-the-scenes experiences, though he does change the names of places and people. He even changes his own name to Thomas in the story, which is odd since his real name is presumably on the book jacket. 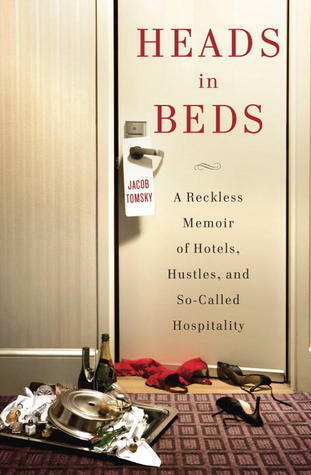 The subtitle of Heads in Beds is “A Reckless Memoir of Hotel, Hustles, and So-Called Hospitality” and for me, the most interesting part of this memoir was the hustling for tips. I have never worked for tips: in college, I accurately judged my shy personality was not up to food service, and that I better stick to working retail. But I have had plenty of friends who did wait tables, and partly due to their stories, I don’t skimp on tips. But earning tips in a hotel environment seems a harder gig because the contact with the doorman, the front desk and the bellhop are much briefer experiences than a waiter would get. But as Tomsky puts it: “All over the world, bellmen are serious about a dollar, but in New York everyone is serious about a dollar, so that makes the bellmen absolutely psychotic about a dollar” (p. 84) At Thomas’ hotel, the bellmen would keep personal lists of frequent, high-tipping guests and make sure to be that guest’s particular bellman during their stay. Thomas himself made sure to alert the bellmen and the doormen to good tippers, and all the staff would bend over backwards to give those guests all the perks in their power to give. Tomsky is frank: he is not moved by stories of anniversaries or first visits to New York, but wrap a $20 aruond your credit card, and he’ll see what he can do for you. I liked getting a peek into the hustling mindset, though I’m quite happy not to be well-versed in it myself. The story of hotels is the story of three groups of people: fellow staff, management and the guests. Tomsky is especially fond when describing his co-workers at the New Orleans hotel. And one of his New Yorker co-workers Orianna basically saves his job when she corners him in the men’s bathroom and badgers him into signing a union card. Not too long after, new management takes over the hotel (which Tomsky has named the Bellevue), and everyone non-union is summarily fired. Take care of our guests. They will love you for it. I will love you for it. I know you heard that lie we told you that every employee, every day, has a large available budget to service our guests in creative ways? It’s actually true. Use it. We will support you in your decisions. In contrast, the new management of Bellevue is actively hostile to the union workers they were unable to fire, and are willing to undercut good guest service in pursuit of taking down their own employees. It all comes to a head later in the book for Thomas, who although a far from perfect employee, gets into trouble over things outside of his control. As for the guests, Tomsky does get dishy about some of them, including Brian Wilson, but it’s not really new stuff here. Hotel guests run the same nice-to-mean gamut as customers everywhere. That said, there are still some interesting bad-guest and good-guest stories. Tomsky includes a few tips for guests at the end such as “Things a Guest Should Never Say”, “Things a Guest Should Never Do”, and “Things Every Guest Must Know” (e.g. how to avoid a same-day cancellation penalty). I rarely stay in hotels, but if I ever do stay in a swanky hotel, I’ll remember to nicely tip all over the place, just to see exactly what difference in service I receive. Who wouldn’t want service like this?